While in the '70s the references to drug addiction in music life could be figured out from crazy and senseless lyrics and weird musical ideas, the '90s were even more harsh in that way. Some newcoming styles simply left no doubts in the listener about the musicians high level of drug abuse and even put that in focus. 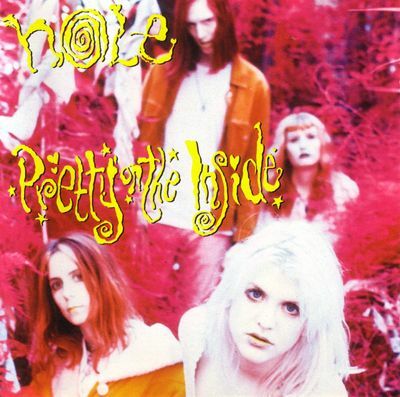 Already at first listening it's clear that the members of Hole didn't have many clear moments while they wrote and recorded "Pretty on the Inside", but exactly this made this album extraordinary. A group of women in the those times uprising grunge wave with it's simple, catchy, but often very ravaged sound, couldn't avoid to sparke wider attention. But it was more about than some light pop-rockin'. They showed a far distorted world of personal and mental issues unleashed by a heavily self-destructive lifestyle and expressed by mind wrecking noise rock. The combination of sometimes melodic, sometimes chaotic themes, explicit lyrics and Courtney Love's singing that often changes into narrative style and ends up in screaming was musically on a borderline in plenty ways. Involved the past times punk behaviour, the mainstream pop-rock sound, and even some elements of the lately developing sludge metal. A quite complex album in feeling and influences, but it's more like spontaneous than well composed. Pretty only on the outside or on the inside, or none of these, it's the listeners job to decide.